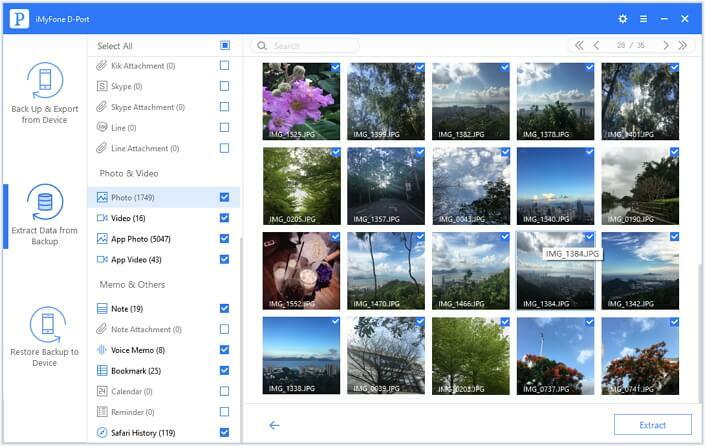 Apple offering free cloud storage really benefits us a lot.We can back up the important data like photos, contacts and messages on iCloud to avoid permanent lose. However, 5GB is not enough and then you have to buy more storage form Apple. In addition, iCloud only allows you to view a few types of data, and you are not able to check the data like third-party apps messages, so you have to restore your iPhone to see the other files if you delete them accidentally. This is not a good solution. 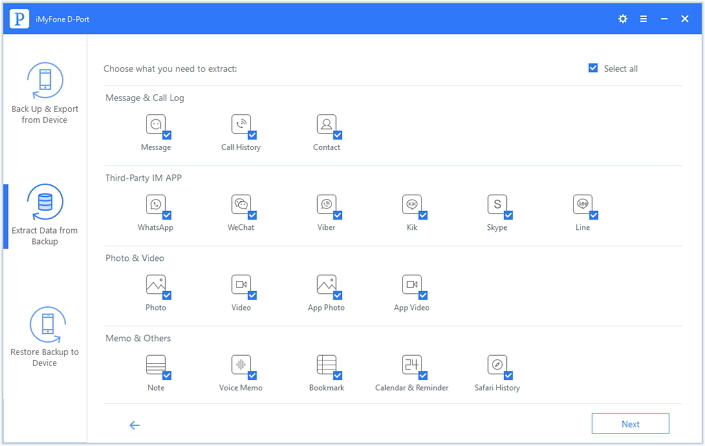 It is not worthwhile to delete all the existing data and settings to get back the files of certain app. Is there any way to extract iCloud backup and selectively download the data you need to computer? iMyFone D-Port is such a backup extractor that is efficient in extracting data from your iCloud backup. Additionally, it also helps to create a backup on your computer which you can access and view at any time you like. You can extract up to 18 kinds of files from the iCloud/iTunes backup, or directly from your iOS devices. 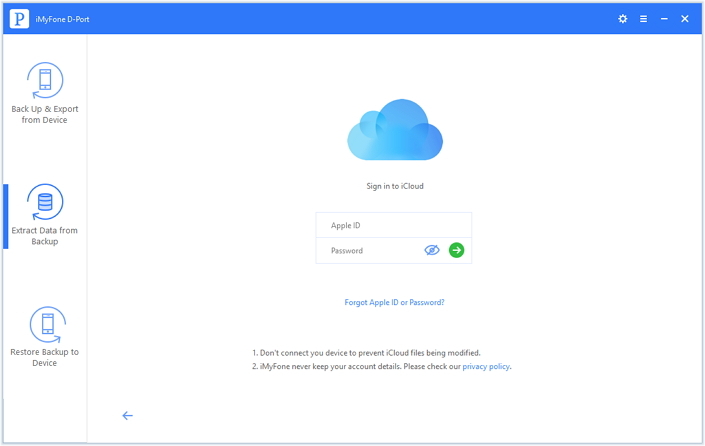 You can access iCloud data on your own computer at any time without restoring the whole backup. You can see all the extractable data before you begin the exporting process, then selectively choose the data to extract. The program supports all the models of the iPhone, iPad, and iPod touch, including iPhone 8, iPhone X with iOS 11 version. Step 1: Install the program on your computer first. Once done, launch the program. On the main screen of the software, click the “Extract Data from Backup” option. There'll be iCloud backups detected. If there is no iCloud backups you need, click "click Download iCloud Backup" please. Step 2: iMyFone D-Port will ask for your iCloud account details. Please rest assured that your account information will not be leaked out by iMyFone. Once it scans, it will display the available files on the interface. You can then select the backup from which you wish to extract the data. Click the “Next” button. Step 3: You can choose the data types that you want to extract from iCloud backup files. Step 4: The different files you have selected previously will be shown on the preview interface after it completes the scanning of the backup file. From the list, you can mark all those you want and press the “Extract” button to extract the data. Step 5: iMyFone D-Port will ask you to select a folder on your computer to save the exported files. You can select a folder or create a new one. Now, an iCloud backup has been downloaded to your computer. 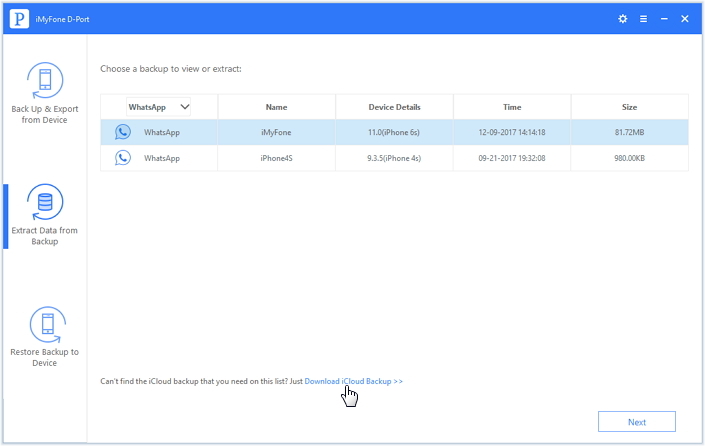 With the help of iMyFone D-Port, you will be capable of selectively extracting various data types from iCloud backup, such as calendar, contacts, messages, notes and so on in a few simple steps. Just have a try now! If I have more than one iCloud backup in my iCloud account, how I know which one include the data i need? Merci…. 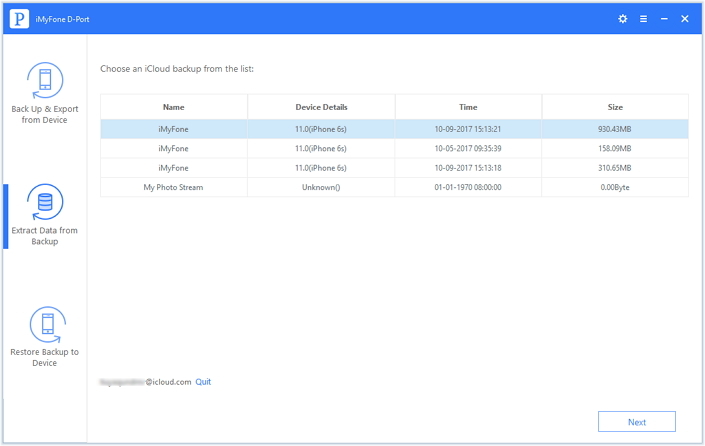 iMyfone D-Back will list all the backups under the iCloud account, and you can choose the exact one according to the date, device name and iOS version.